I had an amazing time at Cedar Lodge. It is really beautiful and clean and everyone was very welcoming. Miss Magge was so helpful. I felt at home there. I recommend if you are looking for a quiet place in Montegobay. It is up the hill but still accesible in taxi to reach the different attractions. 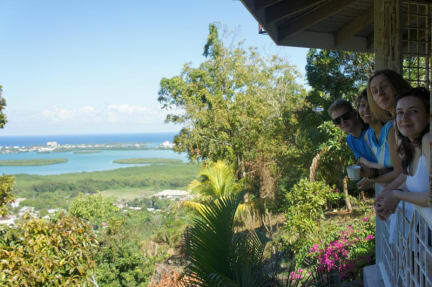 This was our first place to stay in Jamaica and it was a good choice. The hostel is a little far from town on a big hill but the house and view were amazing. Arlene picked us up from the airport and took us to a grocery store and atm if we needed it. She told us everything about traveling in Jamaica, from route taxis to buses, places to stay and see, how much things cost. It was a great place to get adjusted to the country, it was relaxing and peaceful for our first days. THANK YOU! Our stay with Arlene at Cedar ridge lodge was a dream. Arlene went out of her way to make us feel at home and to make sure we knew how to get from one place to the next. She was so helpful and it was so special to be off the beaten path in Mo Bay. Our 3 days with Arlene were more than we could have asked for and we are so grateful for her hospitality. It’s just an added bonus that you can spend forever taking in her AMAZING view. Even though it was a bit far from any shops or restaurants since it's up in the mountains, it is one of the most beautiful places I've ever been. The staff is very caring and friendly, exactly where I wanted to be!! A delicious healthy meal, incredible stories and a gorgeous location. I cannot wait to be back!!! Arlene was an amazing host! She is truly what made our stay so enjoyable. She showed us around town and even stopped for us to get dinner on the way home from the airport. The view from the balcony of the hostel is amazing. It is in the hills and so if you don't like to walk, you will need a taxi to get to places to eat and the more central part of town. Overall though, the hostel was extremely clean, beautiful, and a great value for the money. Thank you Arlene!! Place is very nice with beautiful view and amazibg host. She told us tons of useful information, suggested us where to stay and what to see, do during our trip ... all in all very friendly place. Only a bit difficult to reach. Road is not the best up there. Our stay at Cedar Ridge was unforgettable! Arlene has a beautiful house and a beautiful soul. She helped us plan our days and even suggestions some great unknown things to do. I’m a frequent traveler to Jamaica so this was perfect for me! 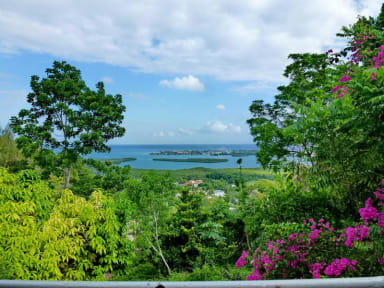 The view from her veranda is stunning and not to be missed. I’m already looking forward to my next stay there. I’ll definitely be back. There were no mesh or mosquito nets and I have literally never been bitten as much as I was at Cedar Ridge Lodge. Despite wearing 50% deet I woke up to new bites every day. Roaches. I had to throw out my cereal because it was full of ants. The kitchen is home to both lizards, mice and ants. Watch out when you lift a cup, something might crawl out. There wasn’t always toilet paper. There were no sponges or brushes to clean dishes. Everyone washed up with their hands.